Contributed photoJuliana Broste and Pine Pienaar, owner of Adventure Paragliding, prepare to take off for a paragliding flight over Glenwood Springs. "It's kind of crazy to run off the side of a mountain," said Broste. "Suddenly you are in the air, and the views are beautiful." GLENWOOD SPRINGS, Colorado – Rand McNally’s Best of the Road rally team – a mother-daughter pair from Littleton – hit Glenwood Springs for the Fourth of July holiday to size up local activities for the mapmaker’s “Most Fun City” competition. “We had a ball. We could not have had more fun,” said Juliana Broste, 28, a freelance video journalist who spends her winters in Vail teaching snowboarding. They are careful not to rank Glenwood Springs among the six communities they are visiting during their three-week, 4,500-mile cross-country trip, but the pair were gushing over their Glenwood Springs experiences even as they were closing in on their next stop, Park City, Utah. TravelingJoan and TravelingJules, their road rally monikers, hit Glenwood Springs around 5 p.m. on Sunday, July 3, and left town bright an early on Wednesday, July 6. 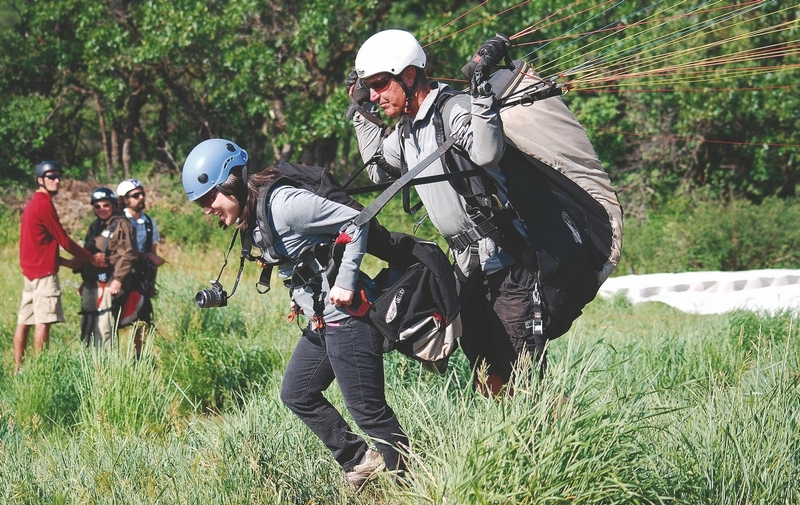 In two days, they sampled the tall adventures Glenwood Springs offers to summer visitors: whitewater rafting, riding ATVs at Bair Ranch, paragliding off Red Mountain, exploring the Glenwood Caverns and riding the giant swing and coaster. Their itinerary was planned in advance by resort publicist Vicky Nash, Glenwood Caverns publicist Mandy Gauldin, and Lindsay Lewis, vice president of tourism marketing at the Glenwood Springs Chamber Resort Association. “We wanted to set up a whole program so it was lined out, but they had the freedom to choose from the list,” Nash said. With each experience, the Broste (it rhymes with “frosty”) pair met friendly locals who made the activities more enjoyable. For their rafting trip with Glenwood Canyon Rafting, their guide was Kate Mycoskie. Taking a flight with Adventure Paragliding proved to be a real highlight. The mother-daughter team is one of five traveling across country, each visiting six finalist communities in five categories: most scenic, patriotic, fun, friendliest, or best for food. They entered an earlier competition to be selected as a road rally team. Juliana used her videography skills to put together a short video application about herself, her mom and why they would make a great touring team. “Who knew that three hours spent on a video would become a three-week road trip of a lifetime, New York City to Los Angeles?” Juliana asked. For the five teams, the competition continues with the chance to win a $10,000 prize and a new car. Once Rand McNally chose the five road rally teams, the entire group was summoned to New York City on June 23. “We had no idea, no clue where we were going when we packed our bags,” Juliana said. In a brief meeting with Rand McNally staff, the five teams were assigned their category, given an itinerary and an electronic route-finder, and the keys to a brand new Saab. “We were very excited to get the ‘most fun’ category,” said Joan. “We were jumping up and down,” Juliana added. With that, the teams were told to hit the road. All five teams must arrive in Los Angeles by July 15. “We didn’t even know which way to turn leaving the parking garage,” Joan said. Before arriving in Glenwood Springs, they visited Myrtle Beach, S.C., Yellow Springs, Ohio, and Santa Claus, Ind. Their last two stops will be Park City, Utah, and Vacaville, Calif., before finishing the trip in Los Angeles. The “most fun” team was originally supposed to visit Sioux City, Iowa. But flooding there put many of the city’s attractions in a pinch, so Rand McNally subbed in the “most fun” runner-up, Park City. They’ve spent one to two days in each spot, and then there’s travel time in between as they drive across the country. “We aren’t supposed to do the VIP backstage pass thing,” said Juliana. “We’re gathering info about these places, what we learn about having fun, from the perspective of a citizen, an average traveler in a car,” Joan said. “Our focus is on the fun things that are thrilling, that get your heart racing. We’re not looking at museums. We are doing the activities and the social gatherings,” Juliana added. Once they finish their visits, they’ll present their findings on July 15 to a panel of Rand McNally judges in Los Angeles in the form of photos, videos, tweets and stories. It will be up to the judges to chose the winning city in each category. The judges will also decide which of the five road rally teams wins the cash prize. Final results will be announced at the Destination Marketing Association International annual convention on July 22. The five winning towns will be highlighted in the 2013 Rand McNally Road Atlas, as well as on USA TODAY’s Travel website. For a complete list of all 30 finalist cities and towns in all five categories, visit http://www.bestoftheroad.com.